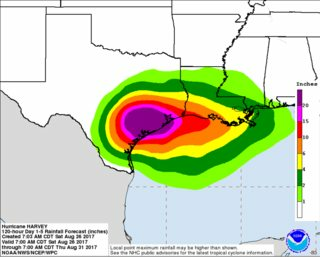 Hurricane Harvey dumped more that 20 inches (500 mm) of rain over a large region, with 40+ (>1000 mm) in some spots... and much more expected. Does the atmosphere really hold that much water? Or is it getting repeatedly evaporated from the ocean and dropped onto the land by the circular winds, implying an enormous evaporation rate while over water? 75 mm is less than 3 inches. We also get in-situ exact measurements worldwide from twice daily radiosonde balloon launches. Unfortunately none are located right near the locations receiving excess rainfall. But you can check US sites of current precipitable water measurements any time by going to SPC's sounding page and looking for the PW value in the left side of the bottom table. SPC also maintains a climatology page for precipitable water and other values. You can see there that 3 inches (76 mm) of moisture in the sounding is extremely rare, and no US site has ever had 4 inches (102 mm) of precipitable water. However, in that study model analyses suggested that evaporation rates in the core of hurricanes are likely no more than 1-2 inches (25–50 mm) per day. It's quite important to notice that heavy rainfall - well over 5 inches (125 mm) - can actually fall in as little as a couple hours almost anywhere, such as in this 2015 flood event in Nebraska. How can that be? You can see the curve at the arrows near the bottom, indicating inflow of surrounding air into the storm. This inflow turns a thunderstorm into more of an engine, processing a continuing stream of incoming air, removing its moisture. In a single cell thunderstorms in an environment without background winds, the "waste" air will eventually pile up and choke off the influx. But even in such circumstances, a few inches of rain may fall. That isn't by using up all of the moisture from the cloud's environment, but instead by using just a portion of the moisture from the reservoir in and around the cloud. If some upper level winds exist to help exhaust the "spent" air, storm systems can persist for even longer periods of time. For example, the Midwestern United States commonly sees long-duration late summer heavy rainfall initiated along stationary boundaries in which inflow lacks direct access to significant warm water bodies. Larger systems that dump huge amount of precipitation over greater areas must pull in a more consistent, stronger inflow of warm, moist air from greater distance. Examples of this happening include the Pineapple Express for rainfall in California/the southwest US, the low-level jet for spring and summer squall lines in the Plains, onshore winds during the Indian monsoon, and air from off the Gulf Stream in Nor'easters. Basically the atmosphere of the entire Gulf (and beyond) is being pumped into the southeast Texas area. So although the air can only hold a couple inches (some 50 mm) of water, and evaporation rates are typically only a fraction of an inch (several mm) per day... bringing that together from such a large source region, and focusing it down into one small area... can lead to these awful extreme deluges. Addendum: It should also be highlighted that the NHC adds in their report on Harvey that rising motion was also enhanced by a front which had stalled in the area. Air being advected in by Harvey's flow would naturally rise over that layer of cooler air when moving inland (a process called isentropic lift), which proves particularly efficient in condensing out the (abundant) moisture en masse into rainfall. 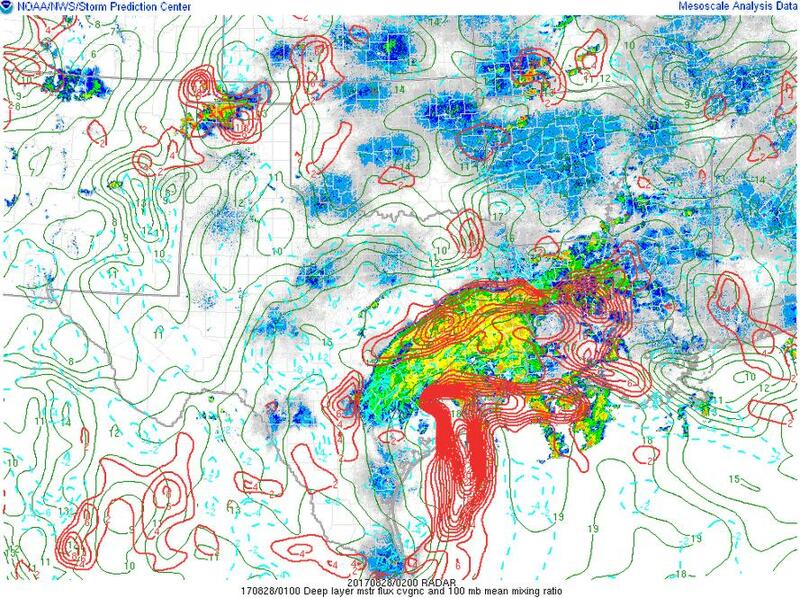 Most substantial regional floods require similar existence of a significant broad lifting mechanisms overlaid with such a relentless inflow of warm, moist air. I invite correction if I missed any details, the column of air above you, at any one time, at 100% humidity can hold maybe 3-6 inches (75-150 mm) of water depending on temperature and it's likey to rain only a percentage of that, not all of it. If air remained stationary, which, of-course it doesn't, then we'd get much less downpours. The hurricane is continuously spiraling in new wet air with water picked up from the gulf. It might rain 2-4 inches (50–100 mm) per hour, which over 10 or more hours can give you 30-40 inches (750-1000 mm). As it rains, the air loses moisture, so the area that gets 30-40 inches (750-1000 mm) smaller in size than the Hurricane. It's the specific area, land just past the ocean or gulf, to the East or North-East of the eye where the saturated bands of rain come in from over the ocean or Gulf that gets hit the hardest. This chart isn't updated, it's a forecast from a day ago, but it gives an idea of the localized high rain fall amounts. The region that gets the 20 plus inches (500+ mm) of rain is smaller than the Hurricane. 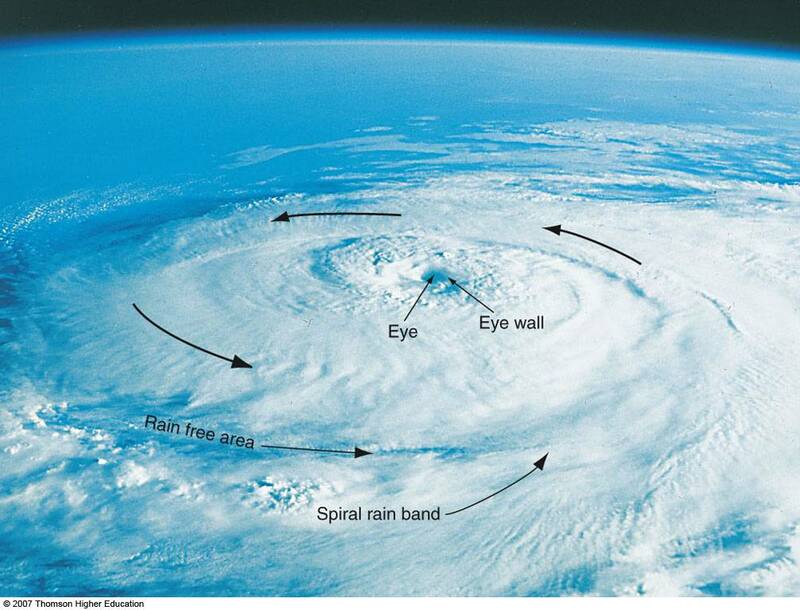 The wind spirals around the eye much faster than the Hurricane itself moves, and it gets saturated to 100% humidity and in a sense, over 100% humidity as it can carry water droplets, as it spirals over the warm waters of the Gulf of Mexico. When it hit's land, the rain continues but the humidity begins to drop, so the rain falls hardest, shortly after landfall and where the rain bands come from over the ocean, Usually, in the East Coast of the US, this is East or Northeast of the eye. (The dirty side, as blacksmith calls it). Air can't hold 40 inches (1000 mm) of rain. No where close, but air blowing over a body of water can supply steady rainfall because the air blowing over the gulf is continuously picking up water. It's new, 100% humidity/saturated and super-saturated air that hits land continuously, raining hard, until the storm passes. Harvey is almost stationary and is rotating new gulf moisture up the "dirty" side (east of the center). I am outside the main path and have 10+ inches (250 mm) in 30 hours (emptied the rain gauge twice). It has been reported that affected areas have exceeded the "500 year" rainfall level. I guess they need a 1000 year level. The atmosphere is pretty big and does hold that much water. The atmosphere can "hold" only maximum 75mm worth of precipitation at any given locality, this is true. However, this particular hurricane Harvey was a very slowly moving structure. The vortex would carry the warm water-saturated masses from Gulf of Mexico, which essentially collided with colder air from the North, generating rainfall. It is the continuous supply of moisture from warmer saturated area that made the rain nearly continuous at some particular locations. If the hurricane structure would sit over one area and not dissipate over time, then the evaporation from the Gulf could sustain the moisture level in the air, and the amount of total rainfall (in limited area) could be even higher. The source evaporation rate doesn't need to be unusual, because a relatively large area of gulf/ocean feeds moist air to a relatively much smaller area of rainfall under this particular type of air circulation pattern. 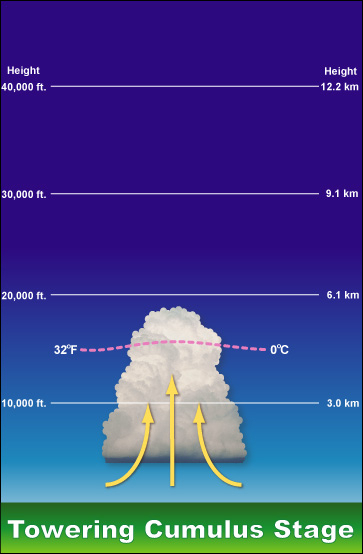 The precipitable water vapor content of the air never exceeds about 3 inches even in the most humid tropical maritime air masses, and in most maritime tropical air masses is typically closer to 2 inches. But Harvey is not limited to the water vapor content in its own region of the atmosphere. 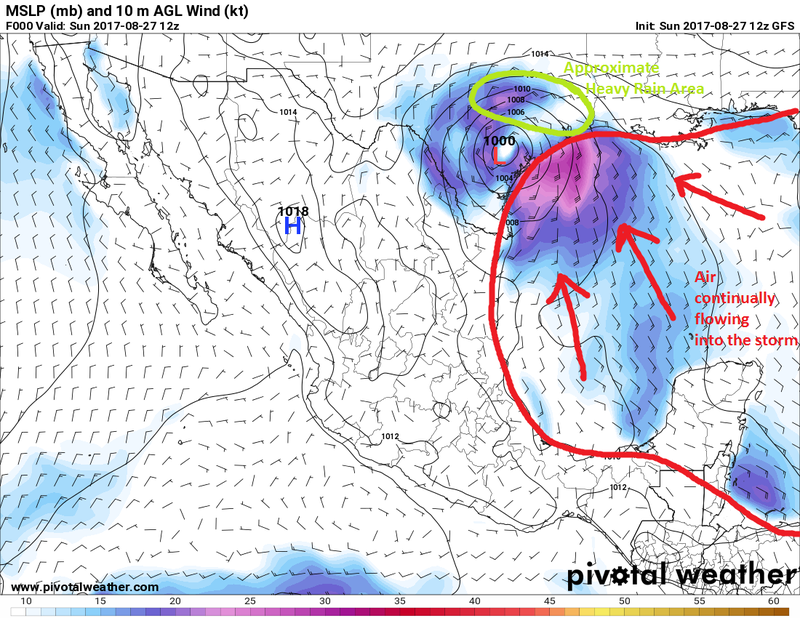 Its counterclockwise INspiraling winds (note the emphasis on IN) continually bring in new water vapor being evaporated from the Gulf of Mexico. The counterclockwise INspiraling winds concentrate the water vapor supply from a region much larger than Harvey itself into Harvey's central region. Thus these counterclockwise INspiraling winds act as a funnel, concentrating what would have been a 2 or 3 inch rain over a large area to a 50 inch rain over a much smaller area. Harvey has been using a rainband to get water in from the Gulf of Mexico. Think of the rainband as a pipe, it is piping water from the gulf to the core, and this pipe has a leaking problem, so the water gets dumped on Austin on it's path to the center. Not the answer you're looking for? Browse other questions tagged rainfall tropical-cyclone or ask your own question. Is there any way to estimate, what is the percentage of the mass of a storm cloud that turns into rain? Is there an upper bound to the amount of rain that can fall in an hour? How accurate is a tipping-bucket rain gauge? How is Doppler radar used in rain prediction? How did a tropical storm starting with “D” end up next to a typhoon starting with “T”? If you were to create the most devastating and powerful Atlantic Hurricane ever, what path would it take and how would the storm progress?